Beautiful! I‘ll get one for sure - to fill the time until Airfix issues this one in 1/48th scale!! Can't claim to be an expert on JPs. Any differences between T3 and T4 other than decals? External differences are that the T.4 has two intakes on the upper fuselage which are the same size as those used on the T.5, these are larger than those on the T.3 (easily scratched though). The elevators on the T.4 are different to the T.3, again, these are the same as the T.5 and feature different shaped horn balance (tip) shape. IIRC, the T.3 has an all black cockpit, the T.4 has a grey cockpit with a black instrument panel (the T.5 is all grey). 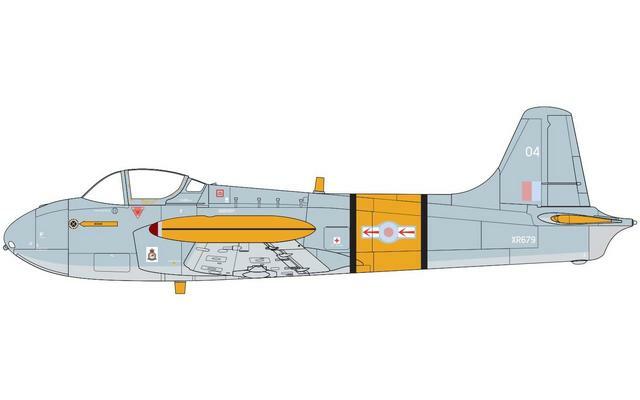 Airfix have previously released the kit in T.4 markings but the mouldings were definitely a T.3, I see no reason why they would have changed anything other than decals for this release. Cheers, Dave, I note you get a mention in the Instructions. The decal artist has done a superb job, full stencil detail (and different for each aircraft, and from the previous releases) and serials etc means if you had a extra from the Aldi Red Pelicans issue , you can do both aircraft as the only decal shared as far as I can see is the instrument panel. There is also the option of the grey scheme without the yellow bands. 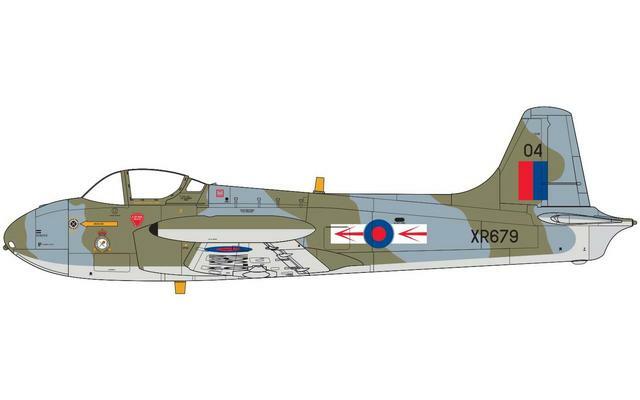 Then you can look at XR679 in her alternative camouflage scheme (without red arrows). Then there are the other 4 camo aircraft / 2 grey (new serials needed) or XR679 in training command colours (stencils and roundels from the original kit) and you can spend a year building 79 Squadron JPs! I really do Like the Brawdy TWU JPs aswel, glad Airfix issued them in a box.